Sign of aging: when a franchise I was too old to enjoy the first time gets rebooted. Further sign of aging: when that reboot spawns a sequel. It could be worse, I guess – when the reboot goes through another reboot, I’ll really know I’m ancient. When the Teenage Mutant Ninja Turtles series hit its commercial stride, I was in college, so it skewed way too young for me. Shockingly, I’ve gotten no younger in the subsequent decades, but I try to maintain an open mind to various endeavors, which led me to screen the TMNT relaunch in 2014. I didn’t love the movie, but I liked it enough to give 2016’s Out of the Shadows a look. 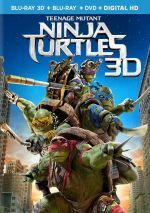 In the first film, crime-fighting overgrown reptiles Michelangelo (Noel Fisher), Raphael (Alan Ritchson), Donatello (Jeremy Howard) and Leonardo (Pete Ploszek) fought and imprisoned a bad guy named Shredder (Brian Tee). Not content to remain off the streets, Shredder uses his “Foot Clan” minions to free him from a police van piloted by Casey Jones (Stephen Amell). This rubs Casey the wrong way and obviously puts the Turtles – who tried to stop the Foot – on high alert. Shredder allies with creepy alien creature Krang (Brad Garrett) to open a portal and allow for conquest of the Earth. Along with reporter friend April O’Neil (Megan Fox), the Turtles and Casey work to stop this. As mentioned earlier, I felt pretty lukewarm toward the 2014 film, and nothing about Shadows changed my mind. Honestly, it offered an experience so similar to its predecessor that I felt tempted to cut and paste my 2014 remarks – little changes here. Actually, I think Shadows works a bit less well, partly because it feels more “kid-oriented” than the prior movie. Not that the 2014 flick offered a “mature experience”, of course, but Shadows just delivers a more juvenile vibe. I think this largely stems from the film’s new villains. In addition to Krang, we find Bebop (Gary Anthony Williams) and Rocksteady (Stephen Farrelly), two humans who get mutated into super-powered anthropomorphic animals. These characters seem so goofy on the surface – and are so overacted – that they lead the film toward an even sillier tone than anticipated. Fans make like the new participants, but I think they take away from the movie. The story doesn’t help. A confused mishmash, the plot lacks focus and meanders from one notion to another without much purpose. In truth, the narrative elements exist to motivate action scenes, so one shouldn’t expect much clarity – and one doesn’t get any. The script lacks punch and cohesiveness. On the positive side, production values remain good. As much as I dislike CG, Shadows executes the Turtles well, so they hold up as believable participants. I rarely had to suspend disbelief when they appeared onscreen, as they integrated smoothly and almost never made me feel like I watched computer creations. A few of the movie’s action scenes pop to life as well. While nothing here matches up with the first film’s surprisingly thrilling “chase in the snow”, some of them boast lively material, and those sequences give the film a bit of pep. Overall, though, Shadows remains a mixed bag. Some parts of it succeed but the whole picture remains erratic and less than satisfying. It’s not a terrible movie but it could be better. 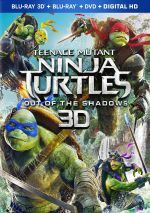 Teenage Mutant Ninja Turtles: Out of the Shadows appears in an aspect ratio of approximately 2.40:1 on this Blu-ray Disc. In terms of visuals, Shadows offered a virtual carbon copy of the first film – which was fine with me, as both looked great. Delineation seemed superb. The movie always came across as tight and concise, with little to no softness on display. I noticed no shimmering or jaggies, and both edge haloes and print flaws failed to materialize. Like most films under the umbrella of producer Michael Bay, Shadows went with a heavily teal and orange palette. This seemed tedious but the disc reproduced the tones well. Blacks appeared dark and dense, while low-light shots presented good clarity. Everything about the transfer impressed. As for the film’s Dolby Atmos soundtrack – which downconverted to Dolby TrueHD 7.1 on my system – we got an engaging affair. The soundscape’s emphasis on action used all the channels on a frequent basis. The various speakers provided lots of information that filled out the movie and blended together in a seamless manner. This formed a dynamic soundfield with a lot to offer. In addition, audio quality seemed strong. Music was bold and full, and even with a lot of looped lines, dialogue remained crisp and natural. Effects appeared rich and vivid, with clear highs and deep lows. I felt pleased with this impressive soundtrack. We Are Family runs eight minutes, 15 seconds and provides comments from producers Andrew Form and Brad Fuller, director Dave Green, and actors Megan Fox, Noel Fisher, Pete Ploszek, Jeremy Howard, and Alan Ritchson. “Family” looks at characters, cast and performances. This tends to be a fluffy piece without much substance. During the 14-minute, 19-second Expanding the Turtleverse, we hear from Form, Green, Fox, Fuller, Ploszek, Ritchson, property master Diana Burton,and actors Will Arnett, Stephen Amell, Laura Linney, Brian Tee, Gary Anthony Williams, Sheamus, and Tyler Perry. “Expanding” discusses non-Turtle cast, characters and performances. Like “Family”, it comes with a smattering of decent notes but tends to lack strong details. Next comes House Party. It fills six minutes, 18 seconds with info from Green, Form, Fisher, Ritchson, Ploszek, Howard, visual effects co-supervisor Robert Weaver, production designer Martin Laing and set decorator Debra Schutt. “Party” examines the design and creation of the film’s “Turtle Lair”. Despite its brevity, “Party” offers a good array of notes. It’s Tricky: Inside the Van goes for four minutes, eight seconds and features Form, Fisher, Ritchson, Laing, Green, Howard, Ploszek, Schutt and Weaver. As expected, “Tricky” tells us about the movie’s “Turtle Van”. It’s another short but efficient piece. More material arrives via The Effects Beneath the Shell. It takes up three minutes, four seconds and shows parts of the film at various stages of visual effects completion. Without commentary, it lacks a lot of usefulness. We also get three minutes, two seconds of ”Turtle Eggs”. With notes from Green, Burton, Fuller, Form, associate animation supervisor Shawn Kelly and screenwriters Andre Nemec and Josh Appelbaum. Here we find a few glimpses of hidden references to the comics and other sources. Some of these seem fun but we don’t learn a lot. Three Deleted Scenes take up a total of four minutes, 54 seconds. We find “Promotion” (2:53), “Career Opportunities” (1:06) and “Kiss Me” (0:55). All three add to April’s screen time, and they also expand the relationship between April and Casey. They’re interesting to see but would have slowed down the film. A second disc offers a DVD copy of Shadows. It lacks any of the Blu-ray’s extras. 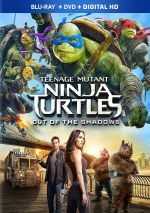 Will fans of the 2014 film like Teenage Mutant Ninja Turtles: Out of the Shadows? Probably. Will it win over new fans? Probably not. Both offer occasional action fun but they lack consistency. The Blu-ray delivers excellent picture and audio as well as a passable set of supplements. Shadows offers some entertainment but it never catches fire.